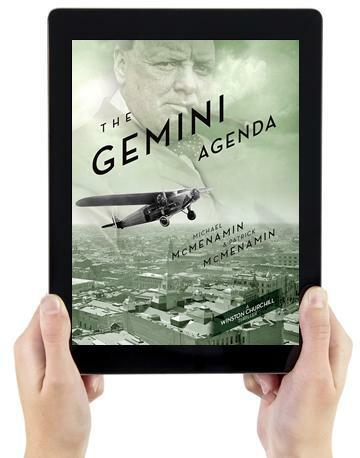 A new eBook edition of The Gemini Agenda by Michael McMenamin & Patrick McMenamin continues the award-winning series of Winston Churchill Thrillers weaving history, intrigue, thrills and romance during the era leading up to World War II. The 3rd novel in the series, it was a 2012 Grand Prize Winner-Fiction in the Next Generation Indie Book Awards and named both a 2012 Historical Fiction Book of the Year Finalist and a 2012 Thriller/Suspense Book of the Year Finalist by ForeWord Reviews. Cleveland, OH, USA — In 1932, Winston Churchill has ominous intelligence from a confidential source in Germany. Across the United States, naked bodies, drained of blood, their eyeballs extracted, appeared at ten remote locations. A serial killer? Or something worse? Churchill’s source believes the answers may lie in Germany. Churchill informs William Randolph Hearst who assigns his best journalist, Mattie McGary, Churchill’s risk-taking Scottish goddaughter, to investigate. Together with her lover, the lawyer and ex-military intelligence agent Bourke Cockran, Jr., they become the target of an international conspiracy that ranges from Wall Street to Washington, DC; from Long Island’s fabled Gold Coast to the marble corridors of the Barlow Palace in Munich, headquarters of Adolf Hitler’s fast-rising Nazi Party that is poised on the cusp of power. Mattie’s discovery in America that all ten victims were twins leads her to learn that there are ten more missing twins for whom “autopsy protocols” will begin in Bavaria in just ten days. Mattie and Cockran embark for Germany on the famed airship the Graf Zeppelin in a race against time to locate and save the twins. In Bavaria, they combine forces with unlikely allies leading to a sinister Nazi clinic in the Bavarian National Forest near the small border town of Passau where Hitler lived as a child. Once there, they uncover an unspeakable alliance between Wall Street-funded American eugenicists and Nazi scientists to conduct lethal experiments on American twins in order to unlock the secrets to creating a master race. Michael McMenamin is the author of the critically acclaimed Becoming Winston Churchill, The Untold Story of Young Winston and His American Mentor. His son Patrick McMenamin is an award-winning journalist who has produced stories for ABC News, Fox News, HuffPost and Buzzfeed. Visit the authors at: http://www.winstonchurchillthrillers.com / http://www.facebook.com/WinstonChurchillThrillers. The ebook version of The Gemini Agenda, a Winston Churchill Thriller ISBN 9781506906065, published by First Edition Design Publishing (http://www.firsteditiondesignpublishing.com), is available on-line wherever ebooks are sold. 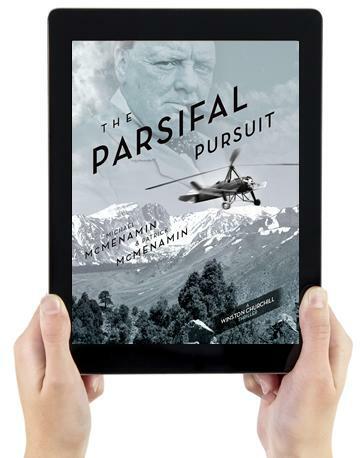 A new eBook edition of The Parsifal Pursuit by Michael McMenamin & Patrick McMenamin continues the award-winning series of Winston Churchill Thrillers weaving history, intrigue, thrills and romance during the era leading up to World War II. The 2nd novel in the series, it was the 2011 Grand Prize Winner-Fiction in the Next Generation Indie Book Awards and also ForeWord Review’s 2011 Thriller/Suspense Book of the Year. Cleveland, OH, USA — In the spring of 1931 a conspiracy in Germany to assassinate President Hindenburg and elevate the Kaiser’s son to the throne threatens the peace of Europe and sets off an epic quest to discover the secret hiding place of the Spear of Destiny, the lance which pierced the side of Christ. Kaiser Wilhelm II insists that the missing Spear-a talisman of bloodthirsty conquerors from Constantine to Frederick the Great-must be found and restored to his family. Adolf Hitler also deeply reveres Frederick the Great and wants the Spear every bit as much as the Kaiser. So does Winston Churchill-growling in the political wilderness-who has gotten wind of the two German tyrants’ obsession with the Spear and is determined to deny both of them a symbol that has led in the past to so much bloodshed. Churchill enlists his Scottish goddaughter Mattie McGary, an adventure-seeking photojournalist for the Hearst media empire, to embark upon a quest to find the Spear and vindicate the vision of her late grail-scholar father. He also persuades law professor Bourke Cockran, Jr., a former military intelligence agent and Mattie’s lover, to represent a US company in Germany targeted by a Nazi extortion racket in Munich. Mattie’s quest leads her to a mysterious villa in Egypt and then to a stronghold high in the Austrian Alps where she is in danger from religious fanatics sworn to protect the Spear as well as Hitler’s SS and the ruthless leader of her own expedition who is both secretly working for the Kaiser and determined to seduce a vulnerable Mattie who mistakenly believes Cockran has left her for another woman. Learning that Mattie’s life is in peril, Cockran mounts a desperate airborne mission to rescue the woman he loves. The ebook version of The Parsifal Pursuit, a Winston Churchill Thriller ISBN 9781506905914, published by First Edition Design Publishing (http://www.firsteditiondesignpublishing.com), is available on-line wherever ebooks are sold. 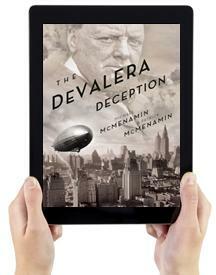 A new eBook edition of The DeValera Deception, by Michael McMenamin & Patrick McMenamin, begins the award-winning series of Winston Churchill Thrillers weaving history, intrigue, thrills and romance during the era leading up to World War II. It was a 2010 Grand Prize Winner-Fiction in the Next Generation Indie Book Awards and named both 2010 Historical Fiction Book of the Year and 2010 Thriller/Suspense Book of the Year by ForeWord Reviews. Cleveland, OH, USA — In the summer of 1929, Weimar Germany’s secret military agreement with the USSR to develop new weapons systems beyond the Ural Mountains is coming to a critical point. Both countries want to dismember the newly revived Poland in a war of revenge To distract Britain from helping the Poles, the new Irish Free State is placed at risk by the arms dealers and financiers of the shadowy “Geneva Group” intent on fomenting an IRA coup d’état In Ireland with weapons and munitions purchased in America. British Prime Minister Ramsay MacDonald gives Winston Churchill a secret assignment on his 3-month holiday in North America. Aided by agents from MI-6, Churchill is to persuade President Herbert Hoover to prevent the IRA weapons purchase from reaching Ireland. Suspicious of the anti-Irish bias of MI-6, Churchill assembles his own team to gather evidence. One is Mattie McGary, Churchill’s goddaughter, an risk-taking photojournalist for William Randolph Hearst’s media empire. Another is Bourke Cockran Jr., a law professor, former military intelligence agent, and the son of Churchill’s old Irish American mentor. Attracted to each other, romance blooms, but their tempers often clash as the two follow a danger-filled trail from New York to Montreal, Cleveland, Chicago, San Francisco and Los Angeles to discover who is funding the IRA and where the arms are being assembled. Along the way, they receive help from such colorful historical characters as Irish revolutionary leader John Devoy; Chicago gangster Frank Nitti; future head of the OSS, William J. “Wild Bill” Donovan; the legendary Jack Manion, head of San Francisco Police Department’s Chinatown Squad; William Randolph Hearst; and, of course, Winston Churchill himself. The ebook version of The DeValera Deception ISBN 9781506906058, published by First Edition Design Publishing (http://www.firsteditiondesignpublishing.com), is available on-line wherever ebooks are sold. The Silver Mosaic, a Winston Churchill 1930s Thriller, by Michael McMenamin & Patrick McMenamin continues their award-winning series with a new, action-packed story of conspiracy and intrigue concerning the Jewish-inspired, world-wide boycott of German exports after the Nazis take power in early 1933. Cleveland, OH, USA — In March 1933, the weak German economy is in peril. Winston Churchill wants to push it over the cliff with a boycott of German exports and take with it the new Nazi government whose brown-shirted SA thugs are terrorizing Germany’s Jews. Working with Cleveland’s Rabbi Abba Hillel Silver, present in Berlin the day Hitler took office, Churchill enlists the help of his goddaughter, Hearst photojournalist Mattie McGary, and her fiancé, ex-US Army intelligence agent Bourke Cockran. Mattie sets out to discover and expose the Nazis’ secret plan to defeat the boycott while Silver and Churchill send Cockran to Prague to retrieve microfilm of confidential customer data stolen from German exporters by anti-Nazi German patriots. Using it, foreign competitors can undercut German exports with lower prices. The Nazis fight back and enlist two unlikely allies: the new US president Franklin Delano Roosevelt and the Jewish Authority in Palestine. FDR opposes the boycott because of the damage it will do to American investors if the Germany economy crashes. The Jewish Authority plans to sell out the boycott in exchange for the Nazis allowing German Jews to emigrate to Palestine with funds in excess of German currency controls. Nazi, Jewish and American MID agents then join forces to wage a deadly battle against Mattie and Çockran that takes them from New York to London, Paris, Berlin, Budapest, Prague, Copenhagen, and Stockholm. Michael McMenamin is the author of the critically acclaimed Becoming Winston Churchill, The Untold Story of Young Winston and His American Mentor. His son Patrick McMenamin is an award-winning journalist who has produced stories for ABC News, Fox News and HuffPost. The first four novels in their 1930s era “Winston Churchill Thriller” series received a total of 14 literary awards. The Silver Mosaic is their fifth Winston Churchill Thriller and they are currently at work on their sixth, The Liebold Protocol. The ebook version of The Silver Mosaic, a Winston Churchill 1930s Thriller ISBN 9781506904511, published by First Edition Design Publishing, is available on-line wherever ebooks are sold. The 440 page print book version, ISBN 9781506904504, and ISBN 9781506904498 hardback, are published by First Edition Design Publishing (http://www.firsteditiondesignpublishing.com) and distributed worldwide to online booksellers. The Berghof Betrayal, a Winston Churchill 1930s Thriller, by Michael McMenamin & Patrick McMenamin, continues their award-winning Winston Churchill Thriller series with a new action packed story of conspiracy and intrigue involving a fake Nazi plot to assassinate Hitler. This fake assassination attempt will allow the Nazis to declare martial law and liquidate their political opponents. Unknown to Hitler, however, his enemies within the Nazi party-the Black Front-are conspiring with renegade elements of his own SS to turn the fake assassination attempt into a real one. Churchill learns of the fake plot and persuades Mattie McGary, William Randolph Hearst’s top photojournalist and Churchill’s adventure-seeking Scottish god-daughter, to investigate. McGary meets up in Germany with her fiancé, American lawyer and former MID agent Bourke Cockran, Jr., who is trying to acquire the rights to Rear Area Pig, a book exposing Hitler’s less-than-heroic wartime service. Mattie and Cockran attempt to stay one step ahead of the SS loyal to Hitler who will stop at nothing to keep Cockran from acquiring the book and Mattie from learning the truth about the fake plot. Michael and Patrick are the co-authors of the award-winning 1930s era “Winston Churchill Thriller” series. The first three books in the series-The DeValera Deception ,The Parsifal Pursuit and The Gemini Agenda-all were named Grand Prize Winners for Fiction by the Next Generation Indie Book Awards and Book of the Year for Thriller/Suspense and Historical Fiction by ForeWord Reviews. The ebook version of The Berghof Betrayal, a Winston Churchill 1930s Thriller ISBN 9781506901619, published by First Edition Design Publishing (http://www.firsteditiondesignpublishing.com), is available on-line wherever ebooks are sold. The 440 page print book version, ISBN 9781506901596 and hardcopy ISBN 9781506901602, is published by First Edition Design Publishing and distributed worldwide to online booksellers.